My husband, daughter and I had just spent a handful of lovely hours with relatives, namely an elderly aunt I featured in a previous HuffPost article, her son and his girlfriend. Rather than be shuttled back to the apartment where we were staying, we had opted to walk back so we could enjoy the balmy, late summer weather, and to walk off some of the wildschwein goulasch and glorious kuchen we had indulged in. When in any world-class city, to walk a series of blocks is to also enjoy its organically formed urban parade, where passersby and seated café patrons form the human element and where window displays provide the material landscape -- endless arrays of the stuff needed to help carve out the diverse means by which these people can allow themselves to be called residents of Berlin. Some windows were intentionally styled tableaus, some were candid portals where the disarray served as proof of long, laborious hours. Having turned off the larger street, we came upon a one smallish, pristine storefront. It was a Schmuckgeschäft, a jewelry store, with no more than a half dozen pieces on display. Centered in this choice array, like an Aphrodite on her purple velvet half-shell presentation box, was a tiara. Neo-classic in design, its lines were clean and ordered, a glittering crescent moon. Multiple rows of diamonds bordered a diamond wreathlet of leaf-like brilliants; its center section featured a graduating array of cerulean-blue sapphires, each one of them surrounded by more diamonds so that the row had the effect of a prized floral garland, opulent yet painfully feminine. The whole of it was topped with an undulating row of yet more diamonds and one last, crowning array of individually encased diamonds and sapphires. My 10-year-old daughter was with us. I instructed her to stand just so in front of the window so that I could photograph her with the tiara hovering behind her head, for a visual play of child and crown. As I clicked away on my phone, a man approached from within. He opened the door; I expected him to ask us to ease back, off of the window, but he did not do that. Instead, he invited us in. He asked my daughter if she'd like to try on the tiara. My daughter looked at me wide-eyed, as if she'd been caught doing something wrong (at the hands, no less, of a star-struck mother), needing my approval and/or reassurance. 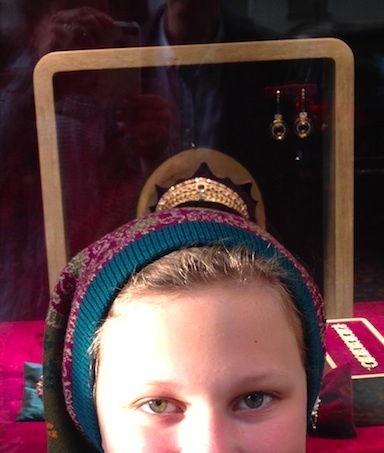 I nodded emphatically and said to her in English that when one is asked to try on a crown, one does not say "No." We entered the shop, which in itself was a jewel -- tiny, impeccable, rich as cheesecake (as I like to say). The proprietor retrieved the tiara from its perch and as he did, told us its story: The tiara had been in the collection of a turn-of-the-century industrialist's wife who was to be presented at court. That event was the sole purpose for its having been created (by a German jeweler) and the only time it was ever worn. Problematic with this exquisite piece, the gentleman went on to tell, was that the tiara was one solid piece, its arc having been shaped in a way that it could not be inverted to be worn around the neck as a choker, nor could it be dismantled to be worn as a brooch or pendant or earrings. You see, practicality evidently has its place even from within the confines of Aladdin's caves. This particular tiara, though a pauper's magical peek into regal opulence of times long gone, is a dubitable masterwork, for it suffers still from its singular, single-use design, which surely was, and is, indulgence supreme. It has been for sale for decades. 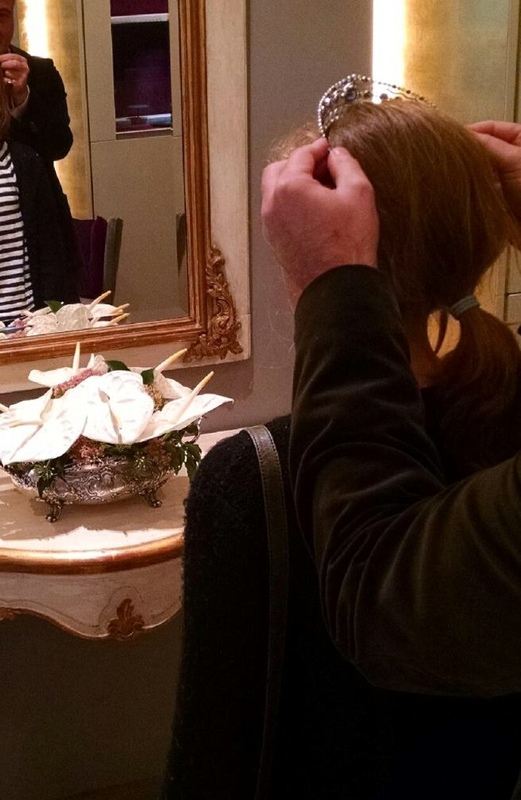 Our host placed the tiara upon my daughter's somewhat unkempt blond head, the two of them standing in front of the gilt-edge mirror, looking, enjoying a moment of dress up, having fun with the plaything of goddesses. He mentioned that he had worked for some years in the US, for a prestigious international jeweler, so he was familiar with "our" jewelry tastes. We shared a laugh in good fun. Returning to the tiara, he noted that the colored stones and design were an issue in terms of re-salability (No, I never asked how much), but then added that I looked like someone who would not have a problem wearing, or having my daughter wear, something different. Compliment received and tucked into my back pocket forever, thank you. Whether or not the tiara finds its way into the hands of some 21st century "industrialist's" wife or his debutant offspring, relative to the brevity by which it served its original purpose, for a brief hour or two at a reception grander than anything I can accurately imagine in the precursor of a city I learned to love back when it was horrifically, momentarily split in two, when as a child I would look upon dark gray sections of The Wall, which would suddenly appear at the ends of garden walkways or between decrepit buildings, having chopped up cityscapes, families and friends, and now, rejoined and alive to the hilt as bustling, born-again European boomtown, that tiara could well count my daughter's blonde, young head as one of its conquests, princess even if for just one minute. The city, like the tiara, though not perfect and weighted to this day with errors of its makers, sparkles anyway and endures, as it should. My daughter put back on her knit cap; we thanked our host, said our good-byes and strolled on.